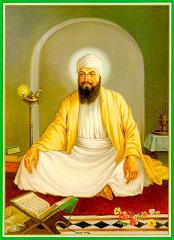 Guru Tegh Bahadur is the ninth Guru of the Sikhs. He was the youngest son of Guru Hargobind Sahib. He was born on April 1, 1621 at Amritsar. His mother was Bibi Nanki. His birth name was Tyag Mal but keeping in view his courage and bravery, he was named Tegh Bahadur. 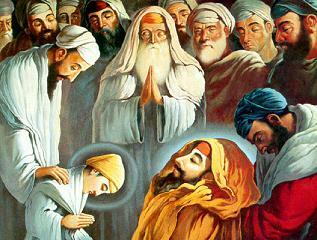 At the time of his eternal rest, Guru Har Krishan Ji bowed down saying, 'Baba Bakale' ie. my successor is at Bakala. Guru Tegh Bahadur meditated at Bakala for about twenty years (1644-1664) and lived there with his wife Mata Gujari and mother Mata Nanaki. He was revealed at Bakala by Bhai Makhan Shah Lobana, a rich businessman. Tegh Bahadur was installed Guru on March 30, 1664 when he was living at Baba Bakala. He made long tours to spread the kingdom of God on earth. Once he went to visit Sri Harmandar Sahib at Amritsar but the Masands did not allow him to go inside and slammed the doors at his face. Guru Tegh Bahadur was arrested by Aurangzeb, the Mughal Emperor. 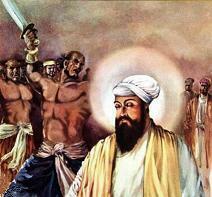 Three devout Sikhs who accompanied the Guru were arrested and martyred in front of Guru Tegh Bahadur at Delhi. or be ready for death. The Guru preferred the latter. His head was chopped off publicly at Chandni Chowk Delhi on November 11, 1675 for being protector of fumdamental human rights. Severed head of Guru Tegh Bahadur was presented respectfully to Guru Gobind Singh by Bhai Jaita at Sri Anandpur Sahib in Punjab. Gurdwara Sis Ganj has been erected inside the town of Anandpur Sahib where the severed and revered head of the Guru was cremated. The headless body was taken away by Bhai Lakhi Shah Vanjara who cremated it respectfully at his place in Delhi on November 12, 1675. Gurdwara Rakab Ganj was erected at this location to commemorate the incidence. This is the second unique martyrdom among the Sikh Gurus. In this case, there ocurred two cremations ie. one of the severed head at Sri Anandpur Sahib and second cremation of the body in Delhi. Guru Gobind Singh son of Guru Tegh Bahadur was a child of 9 years when he was called upon to shoulder the responsibilities of a Guru. Guru Tegh Bahadur is called Hind Di Chaddar' (Protector of India) for upholding the 'Right to Freedom of Religion'. 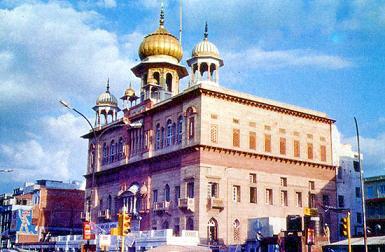 Gurdwara Sis-Ganj was erected at Chandni Chowk Delhi where head of the Guru was chopped off. Kankan Kavi writes that once you promise allegiance to any body, sacrifice your head but do not let him down at any cost. He gives example of Guru Tegh Bahadur who sacrificed his life but did not falter from his faith. Bani of Guru Tegh Bahadur Ji was entered into Sri Guru Granth Sahib by Guru Gobind Singh at Talwandi Sabo, Takht Sri Damdama Sahib. Gobind Rai son of Guru Tegh Bahadur was nominated to Gurgaddi. Guru Tegh Bahadur traveled extensively covering parts of Punjab, U.P, Assam, Bengal and Bihar etc. 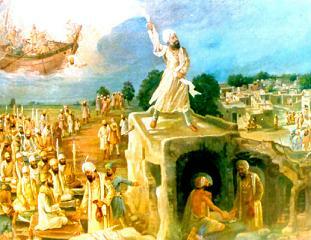 Guru Tegh Bahadur composed 116 Shabads in 15 Ragas. His Bani gives the message of non-attachment. 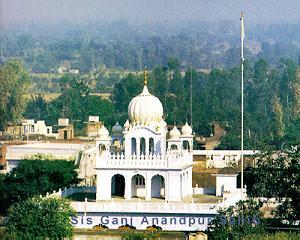 Guru Tegh Bahadur founded the city of Anandpur Sahib in Punjab. Aurangzeb from 1658 to 1707 A.D.
see Life and the Unique Martyrdom of Guru Tegh Bahadur (1621-1675) under Publications. see The Supreme Sacrifice of Guru Tegh Bahadur under Publications.